The PMW-F3 is part of the CineAlta 24P family of digital cinematography products and its support for multiple frame rates includes a filmic 23.98P as well as S-Log workflows. Sony's Exmor™ Super35 CMOS sensor was designed with the benefit of two decades experience in Digital Cinematography, pioneering digital HD acquisition for feature films and broadcast TV through the legendary CineAlta product range. It brings a true 'film look' and superior image quality into reach for independent movies, pop promos, commercials and other applications, as well as making the PMW-F3 an ideal B-camera for high-end feature film production. Exceptional flexibility is a key feature of the F3 along with with multiple workflow options. XDCAM EX's proven high-speed, intuitive workflow offers seamless integration with leading nonlinear editing software - as standard. In addition, a 10bit 4:2:2 HD-SDI output opens up hybrid recording possibilities with a variety of external recording devices. And from April 2011, a Dual Link HD-SDI option will enable 10bit RGB uncompressed signal output - ideal for the high-end film production. This product also comes with the full PrimeSupport package. That's fast, hassle-free repairs, a helpline offering expert technical advice, and a free loan unit while yours is repaired. Plus the peace of mind that Sony is looking after your equipment – and your business. The PMW-F3K is equipped with a Super 35mm sensor which is the same size as Super 35mm film and has been specifically developed for digital cinematography. Its positioning within the chassis is exactly the same as it would be within a 35mm film camera – ensuring exactly the same optical performance with the unrivalled range of 35mm Cine lenses. In addition, Sony's advanced accumulated sensor technologies provide an excellent sensitivity of F11 (ISO 800)* and a remarkable signal-to-noise ratio of just 63 dB*. Unique Exmor™ sensor offers exceptional noise reduction and greatly reduces power consumption. The PMW-F3K offers a powerful 'Slow & Quick Motion' function - commonly known as over-cranking and under-cranking in film shooting - enables users to create unique 'looks' or special effects with slow -and fast- motion images. This can be selected on the control dial on the side of the camcorder. With the 'Slow & Quick Motion' function of this camcorder, images are recorded natively without interpolating the frames. This means the quality of the slow -and fast- motion images is extremely high and incomparable to those created in the editing process. In addition, these slow -and fast- motion images can be played back immediately after shooting, without using any converters or processing on nonlinear editing systems. The PMW-F3K camcorder records 1920 x 1080 HD images using the 'MPEG-2 Long GOP' codec, which conforms to the MPEG-2 MP@HL compression standard. 'MPEG-2 Long GOP' is a mature codec - also adopted by the XDCAM HD and HDV 1080i series of products - which enables users to record stunning-quality HD footage with highly efficient, reliable data compression. The PMW-F3K camcorder offers a choice of bit rates - either 35 Mb/s (HQ mode) or 25 Mb/s (SP mode) - depending on the desired picture quality and recording time. The HQ mode supports both 1920 x 1080 and 1280 x 720 resolutions. The SP mode supports 1440 x 1080 resolution at 25 Mb/s, which provides compatibility with HDV 1080i products. The PMW-F3K camcorder offers a wide array of recording formats for multiple content creation applications. Scanning mode is switchable between 1920 x 1080, 1280 x 720, and 1440 x 1080 resolutions. Frame rate is also selectable from interlace and progressive - 59.94i, 50i, 29.97P, 25P, and native 23.98P*. The PMW-F3K camcorder offers a 'Slow Shutter function' for capturing clear images in low-light environments. This allows the shutter speed to be extended to a maximum of 8 frames. The 'Slow Shutter function' not only increases camera sensitivity but also produces a special blurring effect when shooting a moving object, for enhanced shooting creativity. The shutter speed is selectable from 2-, 3-, 4-, 5-, 6-, 7- and 8-frame periods. The PMW-F3K uses XDCAM EX's proven high-speed, intuitive workflow offering seamless integration with leading nonlinear editing software. In addition, 10bit 4:2:2 HD-SDI output opens up hybrid recording possibilities with content simultaneously recorded on internal memory and, in uncompressed form, on a variety of external recording devices. Both SxS PRO™ and SxS-1A™* memory cards use the PCI Express interface to achieve an extremely high data-transfer speed of 800 Mbps - 1.2Gbps, and can resist considerable shock (1500 G) and vibration (15 G). Also, a unique 'Salvage function' serves to restore content damaged by power loss or memory disconnection during recording**. 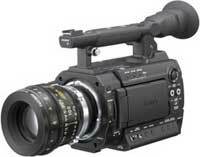 The PMW-F3K is part of Sony's highly successful XDCAM EX product family which supports a high speed nonlinear workflow. With XDCAM EX, recordings are made as data files in the "MP4" format, which is widely used in a number of recent electronic portable devices and has been standardised by ISO. File-based recording allows material to be handled with great flexibility in an IT-based environment - easily available for copying, transferring, sharing, and archiving. All these operations are accomplished without any 'digitising' process required. File-based data copying allows for degradation-free dubbing of footage, which can be performed easily on a PC. The file-based recording system also allows for material to be viewed directly on a PC - simply by inserting the SxS memory card into the ExpressCard slot on a PC or Mac, or by linking a PC/Mac to the XDCAM EX unit via a USB2 connection. This works in just the same way as a PC reading files on an external drive. The file-based operation can dramatically improve the efficiency and quality of your workflow. By virtue of recording on flash memory card, the PMW-F3K can start recording virtually the instant the camcorder is turned on. Moreover, the PMW-F3K automatically records on an empty area of the card - there's no danger of overwriting existing content. This is extremely convenient, as camera operators do not have to worry about accidentally recording over good takes, and they don't have to search through footage for the correct position to start the next recording. In short, it means the camera is always ready for the next shot! Each time a recording is started and stopped on the PMW-F3K camcorder, the content is recorded as a single clip. During playback, users can cue-up to the next or previous clip simply by pressing the 'Next' or 'Previous' button, as you would do on a CD or DVD player. Furthermore, thumbnails are automatically generated for each clip as a visual reference, allowing operators to cue-up to a desired scene simply by guiding the cursor to a thumbnail and pressing the 'Play' button. The 'Expand' function allows one selected clip in the thumbnail display to be divided into 12 even-time intervals, each with their own thumbnail identifier. This is useful if you want to quickly search for a particular scene within a lengthy clip. The LCD Screen can also be used to instantly review recorded footage, as well as access the camera's set-up menus and view thumbnail display status indications such as audio meters, depth-of-field indicators, and the remaining memory and battery time. What's more, the Hybrid LCD screen - which comprises transmissive and reflective panels - offers clear viewing even in bright sunlight. The PMW-F3K has a chassis built around its Super 35mm CMOS sensor. Its lightweight, compact design provides exceptional flexibility when shooting, particularly as a B-camera. It also offers a 'best of both worlds' combination of compatibility with 35mm lenses via a PL Mount adaptor, plus support for a huge range of other Sony and third-party digital cinematography accessories. Sony's chip design expertise means the PMW-F3K operates with exceptional efficiency with an average power consumption of 24W. This makes the camera more reliable, extends its battery operating time and is also environmentally conscious. With the optional BP-U60 battery attached, the PMW-F3K can record continuously for just under three hours (with dual-link option off). #Approx. 14 W (while recording, EVF On, LCD monitor On, IO Select HD SDI & HD HDMI)"